This is a decidedly non-Christmassy plate of food, which is a good thing before the meaty excesses of the next few days. The most complicated thing about this dish is the broth/sauce that accompanies the pan-fried fish, but it is well worth the effort of making a proper stock with the shells of the prawns. First, make a stock. Roughly chop all the vegetables, except the tomatoes which can just be halved. Heat some butter and oil in a saucepan and fry the prawn shells. When they turn pink add the vegetables and carry on frying. The smell will be gorgeous. Add the pastis and flame off the alcohol. Then add the saffron, bay leaf and parsley, stir and add the water. Bring to a rolling boil, reduce the heat, cover and simmer for around 45 minutes. Strain off the stock through a sieve, pressing down to get out all the lovely juices. Then throw away the prawn shells and vegetables. Now you can reduce the volume down to around half and season. Add the crème fraiche and cook until everything is nicely amalgamated and smooth. When you are ready, reheat the mashed potatoes with some butter and cook the green beans. Keep warm while you cook the fish. Heat some butter and oil in a frying pan, season the halibut and fry on both sides for 3-4 minutes. Halibut is a meaty fish and will take longer to cook than some other types of fish, like plaice or sole. 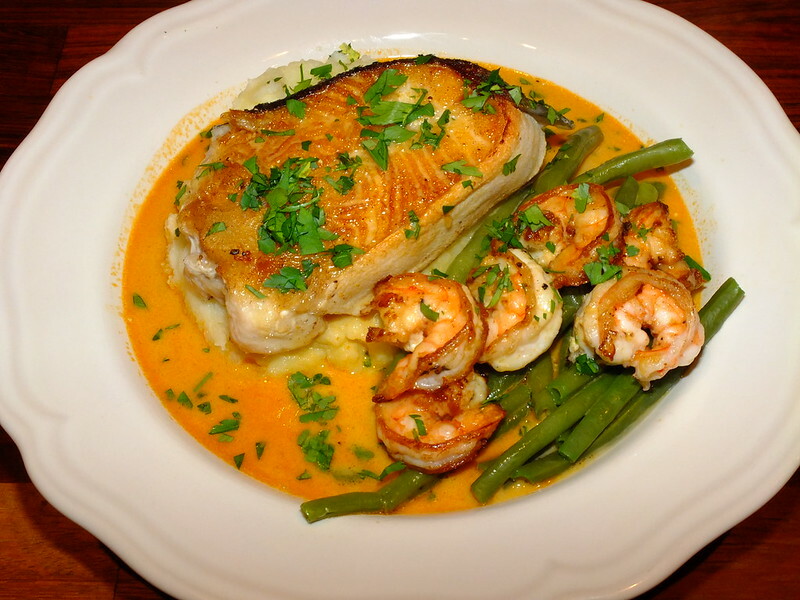 When the halibut is done, set it aside and sear the prawns in the same pan. They will only take around a minute or so to turn pink and take on a nice seared appearance. Serve the fish in a shallow bowl on top of the potato and with the sauce poured around it and with the green beans and prawns. Garnish with chopped parsley if you wish. This cries out for a good quality white wine, ideally not a heavily oaked one. I would personally choose Sancerre or a lighter style of white Burgundy. Muscadet would also work, especially if you choose a “sur lie” example.